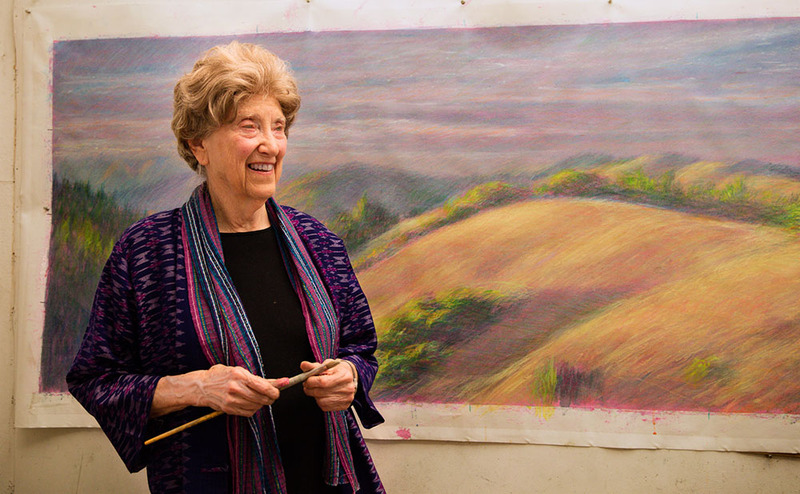 Connie Smith Siegel has taught, painted and exhibited widely in the bay area for over thirty years. Her landscapes, painted directly on location, come from an intimate connection with the earth—the spirit and light of specific places. She has traveled widely, and is a passionate observer of the light conditions in different seasons and times of day, from the winter fields of Colorado to northern islands to desert and mountain areas. The different aspects of nature have become metaphors for feeling states, inviting both excitement and peace. The connection to nature is expressed in Connie’s teaching, which bridges the world of aesthetic form with the meditation practice of Sensory Awareness. Her workshops on drawing and color offer a new approach to art education, based on each person’s unique point of view. She defines creative expression as a language of the body, universally available to everyone, whether artist or not. From this inner connection, Connie has encouraged the natural development of personal style in drawing and color in both university and meditative contexts. Connie’s three books carry forward a commitment to self-discovery and creative growth developed in her years of teaching. Using student and master drawings, Spirit of Drawing demonstrates the power of individual perception as a source for effective abstraction and representation. She combines the elemental and emotional aspects of color with a recognized system of color theory in Spirit of Color. Her forthcoming book, The Healing Spirit of Drawing and Color, demonstrates the healing/integrative power of visual expression in resolving life issues.